The previous day and evening I had done a lot of moving around, so I was content to start the day slowly. After my visit to Mirador San Nicolás the evening before, I had returned to my room at the guesthouse where I finished the cheese bocadillo purchased that morning in Madrid, drank a beer, and then went to bed. I slept deeply and long in the little cave-like alcove where the bed was located. Follow this link to see the room I inhabited at el Numero 8 to see what I mean about the bedroom. It was quiet and dark and very comforting, not claustrophobic at all despite the lack of windows. I slept until nearly 10 am, which is very unusual for me. When I finally got up I made some instant coffee and breakfast, then started reviewing my guidebook’s thorough information on Alhambra in preparation for my visit later that afternoon. I took a break in my planning to wash a load of laundry and hang it out to dry. Finally at around noon I filled my water bottle, packed a few more snacks (another piece of fruit, some nuts) and left the room to get on about the day. 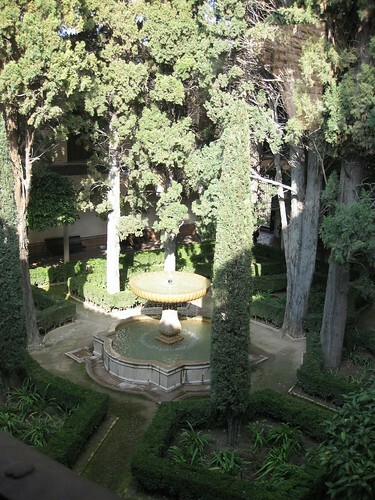 In order to manage the flow and impact of the numerous people who visit Alhambra every year, there are strict rules about entering the Alhambra grounds. When an entrance ticket is purchased, a time to enter the Nasrid palaces — the jewel of the Alhambra complex of buildings — is chosen by the purchaser or assigned by the tour operator. I had chosen an entry time of 15:30 (3:30 pm) because that block didn’t seem quite as full at the time I purchased my ticket online a few weeks before leaving Chicago. Since I had an afternoon entry for the palaces, the entry rules further dictate that the earliest I could enter the grounds was 14:00. The guidebook recommended entering the grounds at least 30 minutes before the time on the palace ticket as there was a long walk from the grounds entrance to the palace entrance. 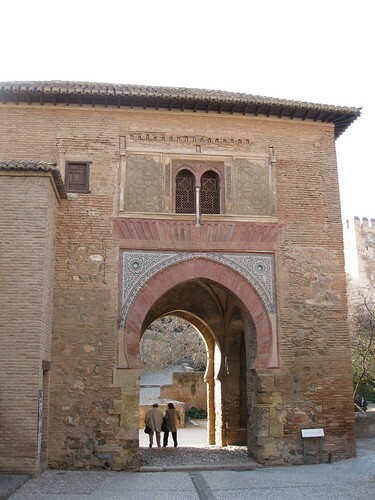 It was further recommended that the other aspects of the Alhambra complex — the fort or alcazaba, the Generalife gardens, and the palace of Charles V — be visited before the Nasrid palaces, if possible. I had retrieved my ticket and scoped out the entrance the day before, so I had a some piece of mind about how long it would take me to get up to the entrance and no worries about getting stuck in a long ticket line. 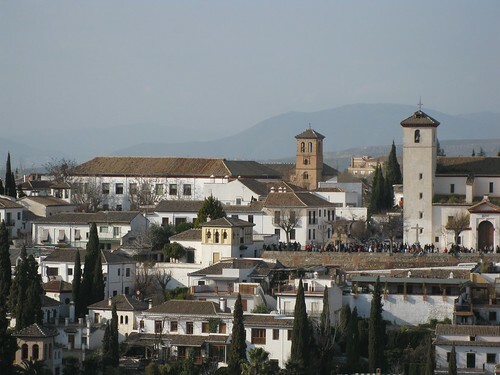 When I left my guesthouse at noon, I had plenty of time to catch the bus, so I decided to spend an hour viewing some of Granada’s other sites first. I made my way to a stop for the Alhambra bus at about 13:00, and made it to the entrance at 14:00 as planned. After entering through the checkpoint and splurging on an audioguide, I started the walk through the grounds towards the main sights. Like many other suckers, then, I was left with no choice but to buy a sandwich from a vending machine for my lunch. First I had to break my 20€ bill, though, and I was glad to visit a vendor selling chips and packaged snacks to do just that. I took my bag of chips and vending machine sandwich (salmon salad on the Spanish equivalent of Wonder bread) to a bench in the sun and enjoyed the surroundings, at least. The Alhambra is just stunning. It’s an overwhelming feast for the eyes and senses, which makes it a great challenge to write about and to share with photography. After my lunch I entered the Charles V palace for a bit, but I had no time to visit the the museums housed inside. Despite getting to the grounds 90 minutes early, I only had 30 minutes left before my ticketed entrance time for the Nasrid palaces of 15:30. I wandered back out of the Charles V palace thinking I may be able to quickly visit the fort, but with such a short period of time open I decided instead to refresh myself with a small glass of cerveza. Once I was through the checkpoints and in the palace I went a bit camera crazy. The details in the architecture were just so fascinating to me. I had little sense of time passing as I wandered the complex taking photo after photo. It was impossible for me to capture the fine details on the ceilings with my little point and shoot camera, yet I tried to do so over and over. I took photos of door hardware and tilework, too. My photo collection from the Nasrid Palaces is a mix of macro and micro. The famous Court of the Lions was blocked off for restoration, but the beautiful Court of Lindaraja was a fine sight. After I found the way out, too, and visited a restroom I noticed that the grounds were pretty empty at this point. It was near 17:00 and I needed to turn my audioguide back within an hour, but I had yet to visit the fort, so quickly made my way to the entrance. Perched at the very end of the high peninsula of the Alhambra, the fort has spectacular views. But that’s about all it has. It was interesting to see all the people gathering at Mirador San Nicolás from the other side, but there wasn’t much else to admire. I was in and out of the fort in about 15 minutes, then made my way back to where I entered Alhambra. 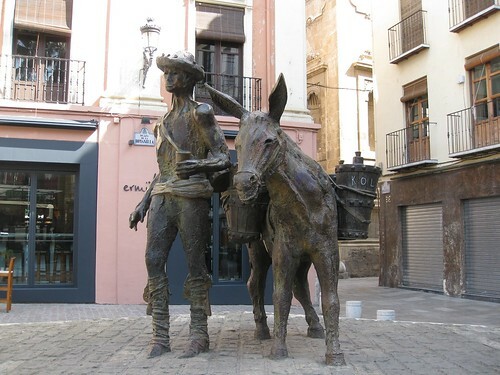 Instead of riding the crowded bus back down into town, I instead walked the tranquil Cuesta de los Chinos path just outside the walls, ending up next to the small remains of the Rio Darro. I had been walking a lot, so I felt no guilt in catching the bus up into the Albaicín quarter, where I stopped at the small market to buy a bottle of red wine and a green pepper, and was gifted with some fresh bread rolls by the proprieter. Back at the guesthouse I made a small tapas plate of sauteed green pepper, cheese, and the fresh bread rolls with some wine. (Why didn’t I note anything from the wine label? It was a local red and it was delicious.) I took my plate up to the rooftop terrace to relax and enjoy the last of the sunshine. Then I heard the guesthouse host talking with someone in English and met the newest occupant, another single woman traveler from the U.S. We chatted for a few minutes and then parted as she went to unpack and I took my morning laundry off the clotheslines and down to my room. But she and I met up again and made plans to go to dinner that night. One of the things that had concerned me about taking this trip by myself was that I would feel lonely at night, and especially during the evening meal. I was excited to have dinner with another person, and it seemed even better than she was an American woman traveling solo, too. I imagined we could swap tips and stories with each other and have a fun time. The actual event was OK, but it also made me realize what I had avoided by traveling on my own: all the negotiations involved in doing something with another person. We had to decide what time to dine, what sort of food to eat, where to eat, and how much we wanted to spend. After all those things were figured out we wound up at a “Moroccan” restaurant at the edge of the Albaicín where we had a fairly expensive meal. Well, at least I had some leftovers. By the time dinner was over it was drizzling pretty steadily and the walk back to the guesthouse across slippery cobblestones was treacherous enough that I was glad to have drunk nothing stronger than lemonade with dinner. We parted ways at our respective rooms and I settled in for another quiet, restful night in my snug room. I have South Dakota etched in my brain. For the past several weeks I’ve had a compulsion to drive to South Dakota. It’s not as if I’ve turned into the Richard Dreyfus character from Close Encounters of the Third Kind (besides, he was obsessed about Devil’s Tower which is in Wyoming and not South Dakota…although Devil’s Tower is pretty darn close to the South Dakota/Wyoming border), but I think it about it a lot. I’ve been thinking about it so much and have had such a strong compulsion that I actually ordered the South Dakota Vacation Guide from their official tourism website. And it arrived in the mail yesterday. Yay! When I was a kid, we took driving vacations every year. These weren’t just jaunts to the Wisconsin Dells or Springfield, these were long road trips to places like Florida and Texas. (Actually, they were always about Florida or Texas for some reason.) These trips usually involved camping, first in our pop-up trailer and later in our mini-motor home. Even though we had the short attention spans typical of most kids and everything didn’t always go right (a flat tire in Alabama and a hood malfunction at high speeds were quite memorable), I remember these trips very fondly. It was fun to whiz down the expressway at 75 mph (that was the speed limit for the most part back then) with the windows open, playing games that involved car license plates and signage. There were kitschy road side attractions and Stuckey’s every few miles to keep us from getting too bored. Lookout Mountain? Been there. Okefenokee Swamp? Yep, been there, too. (And I have a really funny story about a raccoon encounter in Okefenokee, too.) Also, amusement parks were visited. Six Flags over Georgia, Six Flags over Texas, and the ultimate amusement park: Disney World. In fact, we visited Disney World every year for seven years in a row. We were Disney World pros and developed our own system for visiting the park with minimal waiting in line and minimal cost. Back then you didn’t pay an all-inclusive price, you purchased books of tickets. There were A, B, C, D, and E tickets. E tickets were used on the high end rides like the Haunted House and Space Mountain. Hence the expression “that was an E ticket experience!” The lower cost ticket books had relatively few E tickets, so they were very a precious commodity. We would go to the park in the morning, then stay at the park until lunch time. Then we’d head back to our camp site to eat lunch, swim, nap, etc. and finally eat an early dinner. At around 6 PM we were back at the park and hanging around the entrance. Families often left at this time, too tapped out from the high cost of lunch and trinkets to spring for dinner at the park, too. So we would often get offered — or even ask — for leftover tickets and then head back inside and stay until the park closed at 10 PM. We were thrilled when we copped ticket books with unused E tickets! It was a brilliant system. So I think that’s what I’m really craving: the joy of the unexplored, open road. The promise of a thrilling E ticket experience at the ultimate destination just a few more hours away. And the camaraderie of a good road trip, too. Because of course I don’t want to do this alone, either. It was wonderfully, unseasonably warm today. A perfect day to be outside, although that wasn’t really possible for very long. I was in the office most of the day, but I did escape at midday to walk a few blocks and have lunch with a colleague. Tomorrow is supposed to be just as nice, so it will be very hard to keep myself focused on work while I’m telecommuting tomorrow. I know this is just temporary. After all, we’ve just started March, which can be a very unpredictable month in Chicago. I’m sure we’ll see more snow and blustery cold, but at least I won’t be here for all of it! I’ll be going out of town next Wednesday to the (hopefully) warm and sunny Caribbean for a few days. This is my little gift to myself after putting up with so much crap for so long. So, even though I wish I could have gone out of town earlier, I will enjoy every minute of this small break. One minor complication to my daily routine and plans for a holiday is…clothing. If you’re old enough, you may recall the tagline of a shampoo commercial “Don’t hate me because I’m beautiful.” Well, don’t hate me, but…my problem is that I’ve lost so much weight that I have problems fitting into my clothes. Even within the past month, stuff I’ve bought at the thrift store and such as now too large. Unfortunately, I’m sort of between sizes now, too, so it’s hard to find things that fit well and aren’t either too big or too small. My suits for work are useless to me now. All of them. Even the “smaller sized” ones. I will look into having them tailored down, but not until I’m done losing weight. I’m just now inside the normal range for BMI and would like to lose about 10 more pounds, which would put me squarely within the middle of the normal BMI index for my height. At this point, I’m working out at the gym 3 days a week (1 day with the trainer, and 2 days on my own) which all involve cardio and strength training. And, I’m horse riding for 30 minutes a week, which is also quite a work out. Posting the trot is *definitely* a cardio workout, as I’ve documented by wearing my heart rate monitor during each session. So, I’m getting smaller which is ultimately good. And, I’ll get a chance to enjoy my smaller, lighter self in a bathing suit soon. Yay!